Step off the beaten path and head to Karon View Point and Phromthep Cape. Explore Patong's surroundings by going to Wat Chalong (in Phuket Town) and Nai Harn Beach (in Nai Harn). On the 16th (Sat), spend an adventurous day with a kayaking and canoeing tour. Spend the 17th (Sun) among aquatic life with a scuba or snorkeling tour. The adventure continues: stop by Instyle Fashion, enjoy the sand and surf at Patong Beach, make a trip to Bangla Road, and admire nature's wide array of creatures at Tiger Kingdom. For reviews, photos, other places to visit, and other tourist information, read our Patong travel itinerary planner. Ubud, Indonesia to Patong is an approximately 6.5-hour combination of taxi and flight. The time zone difference when traveling from Ubud to Patong is minus 1 hour. In September, daytime highs in Patong are 36°C, while nighttime lows are 27°C. Finish your sightseeing early on the 19th (Tue) so you can travel to Bangkok. Spend the 22nd (Fri) wandering through the wild on a nature and wildlife tour. 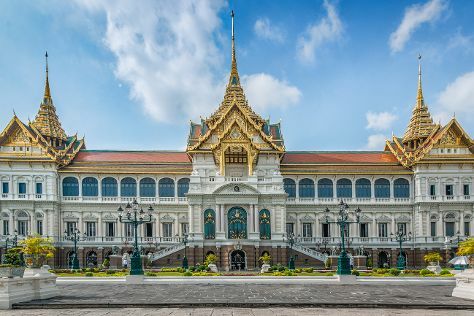 There's lots more to do: explore the historical opulence of The Grand Palace, take in the spiritual surroundings of Wat Saket, admire the landmark architecture of Jim Thompson House, and get a taste of the local shopping with Chatuchak Weekend Market. To see where to stay, reviews, and more tourist information, go to the Bangkok trip itinerary planner. Traveling by flight from Patong to Bangkok takes 3.5 hours. Alternatively, you can drive; or do a combination of taxi and bus. Expect a daytime high around 38°C in September, and nighttime lows around 30°C. Finish your sightseeing early on the 22nd (Fri) so you can travel back home.